It seems appropriate to post my final addiction-themed post of the year on New Year’s Eve. I’m already anticipating the usual New Year’s Day article decrying the scenes in Britain’s towns and cities, amply illustrated with photos of young women in high heels slumped on benches and on the edge of pavements (the Daily Mail seem to do this each year like clockwork). The trope of the woman collapsed in the street, worse the wear for drink or other substances, isn’t a new one, nor is it confined to Britain. In 1897 a number of American newspapers carried a piece entitled Picked up on Broadway, vividly describing an incident in which a woman was found unconscious in the street and hurried to the nearest hospital. Once there she was discovered ‘to be covered with sores caused by the hypodermic injection of morphine’, which she had begun taking to relieve the pains of a uterine disorder. The piece was accompanied by an illustration of the woman’s collapse: helped up by a male passer-by, her eyes downcast, one arm propping herself up on the pavement, the other held limply in her lap. By her side lie the packages she has dropped in her fall. In the background, another man advances towards the scene to help and a woman raises a hand to her mouth in shocked fascination. Headline of an 1895 advert for Dr. Pierce’s Pleasant Pellets. The figure of the lady slumped on the pavement in Picked up on Broadway mirrored the ‘unfeminine pose’ often used by Victorian temperance authors. Rachel McErlain in Women and Alcohol: Social Perspectives (2015) contends that images of drunken women being carried from public houses on stretchers, for example, ‘shock[ed] the viewer … [and] reinforce[d] the message that female intoxication [was] dramatically different from normative feminine bodily practice’. The depiction of the woman collapsed on the pavement could be a powerful shaming practice, drawing attention to the drinking or drug-taking woman as deviant, but also capitalising on the public appetite for sensation. Adverts such as Picked up on Broadway, or those for Dr. Pierce’s Pellets, could serve a double purpose: critiquing the behaviour of the modern woman and at the same time selling a product to the reader. I’d be interested to know how far 19th-century readers of these ads actually considered the problem of drug use or drinking in any depth, or if – like those being pleasingly shocked by images of more modern New Year’s Eve debauchery – it was simply a brief bit of entertainment. A man lies dead or unconscious in his chair, his last glass of drink fallen from his hand. Lithograph by Lamy, c. 1860, after Villain. Wellcome Library, London. I’ve been doing a lot of work on lady secret drinkers recently (such as the eau de cologne tipplers I devoted a previous post to), but a question from the audience at a talk I gave a few weeks ago reminded me that, somewhere in my office, was a file of other 19th-century problem drinkers – namely, male professionals. Digging around in a filing cabinet, I found the surreptitious tipplers I was looking for. These were ‘respectable’ problem drinkers who occupied responsible positions – men who incorporated alcohol into their lives without their habit being obvious to the casual observer. Lawyers and their clerks were common points of concern. In 1871, the Saturday Review railed against what it termed ‘counting-house alcoholism’, declaring that ‘men who shr[a]nk from going to one of the public bars ha[d] no scruple about fitting up a neat mahogany cellar in their own office’ and all too often resorted to the ‘forenoon specific’ of a biscuit and a glass of sherry. A patient dismayed at his doctor’s advice not to drink any alcohol. Wood engraving by G. Du Maurier, 1875. Wellcome Library, London. One of the hallmarks of the sci-fi horror genre is its tendency to generate instant clichés. In the digital age, the lag-time between the initial appearance of an innovative and genuinely frightening cinematic moment and its inevitable end in yawn-inducing familiarity is extraordinarily brief. Of course, this is not surprising. A scare by its very nature needs to be unexpected. Once we are able to see it coming, its potency is lost. But, like all good monsters, it dies at least twice, its double-death inhering in its especial vulnerability to parody. Thus, the truly disturbing creature created for the Alien films by H.R. Giger, a nightmarish meld of the mechanical, the bestial and perverse sexuality, before it descended into the unbelievable crassness of the Alien vs. Predator spinoff franchise twenty-five years and some half dozen films after its debut, had actually already reached its use-by-date as a scare tactic by the time of the first sequel. Within a year of 1986’s Aliens, Mel Brooks had the monster burst from John Hurt’s stomach once again, this time to perform a Looney Tunes-style rendition of “Hello, Ma Baby” complete with a straw boater, in Spaceballs. Its ignominious future notwithstanding, back in 1979, Giger’s alien design was revolutionary because it departed from the tentacled type that had become the well-worn and utterly expected shape assumed by extra-terrestrial lifeforms in cinema. Giger’s alien found its monstrousness by drawing upon resources from outside the folkloric tradition. In this way, Giger mirrored the earlier radical break that had given rise to the very kind of alien-octopus he sought to distance himself from, the kind of creature epitomised by those that appeared in the later tales of the American author H.P. Lovecraft (1890-1937). As China Miéville notes, “rather than werewolves, vampires, or ghosts, Lovecraft’s monsters are agglomerations of bubbles, barrels, cones, and corpses, patchworked from cephalopods, insects, crustaceans, and other fauna, notable particularly for their absence from the traditional Western monstrous.” Cephalopods were a favourite of Lovecraft’s, with the tentacle becoming his default type of monstrous limb but one which had previously seen proto-iterations in the fantastic horrors of H.G. Wells, Jules Verne, and Victor Hugo (Miéville 512). It is not difficult to point to concerns in contemporary culture that may have given rise to Giger’s seductive biomechanical alien, such as the deepening in the complexity of our understanding of gender and sexuality, and our increased dependence on technology and machinery for our very existence. We may similarly speculate as to why the correlation between the alien and the octopus might have had stronger resonances within the nineteenth-century consciousness. 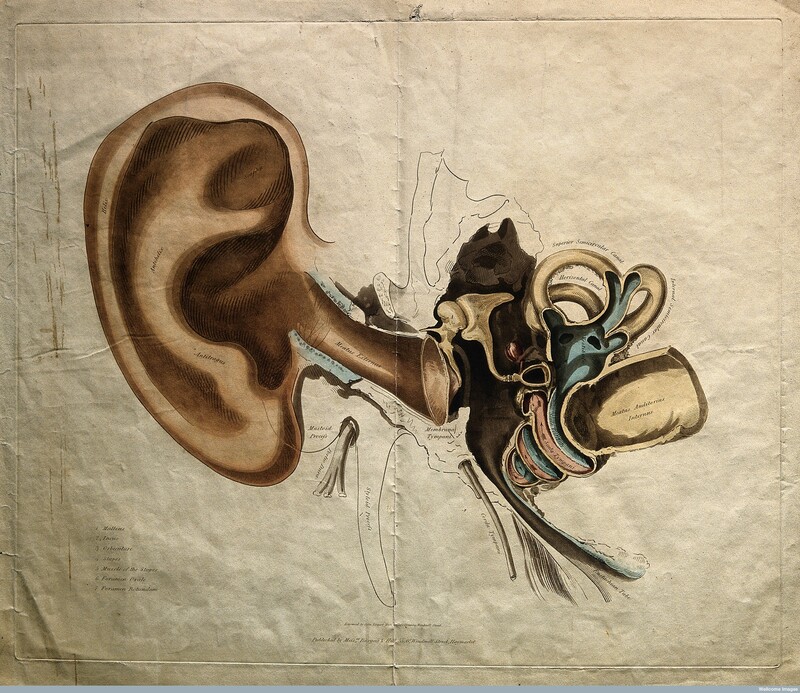 I would posit a connection between the tentacle – this flexible, elongated, and generally highly receptive organ – and the new pervasiveness of the nervous system in nineteenth-century constructions of modern life. This is made quite clear by the frequent conflation of tentacles and nerves in the portrayal in the period of alien and monstrous races. 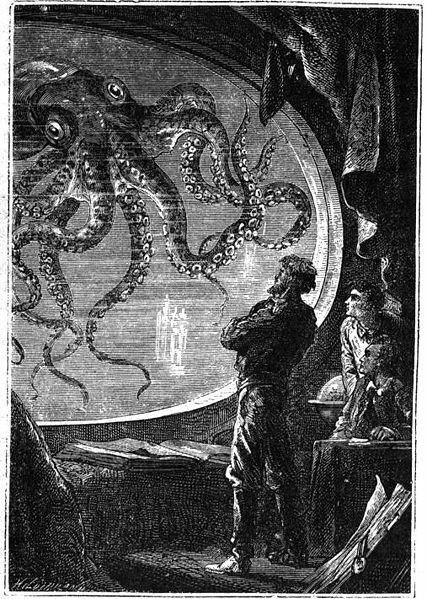 Like the human-eating ‘Sea Raiders’ of Wells’s 1896 short story, the bizarre creatures to be found in Arthur Conan Doyle’s short story ‘The Horror of the Heights’ (1913), and the monstrous squid in Hugo’s Toilers of the Sea (1866) and later in Jules Verne’s Twenty Thousand Leagues Under the Sea (1870), the creatures that inhabit aliens worlds are complex masses of brains, tentacles, coils, and nervous centres, and they evoke the disturbing sense that they conceal an intelligence superior to humanity behind an alien, unknowable form. Explicitly compared to the octopus by an eye witness to their invasion, Wells’s Martians in The War of the Worlds are, like the cephalopod, comprised of highly complex nervous systems arranged around a comparatively large and almost transparent brain. 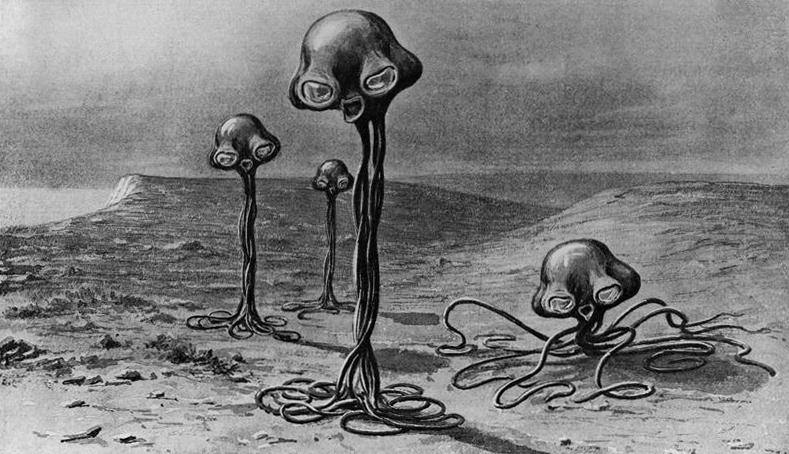 Each Martian is approximately four foot in diameter, the majority of which consists of “the brain, sending enormous nerves to the eyes, ear and tactile tentacles”. Similarly, the Grand Lunar, the ruler of the Selenites in The First Men on the Moon is simply a “marvellous gigantic ganglion” that relays sensations and neural commands across the vast network of Selenite minds. This, then, might be the third death to which the genuine thrill is doomed. Since its efficacy depends upon its ability to tap into anxieties and preoccupations of its specific historical moment, once these conditions that supported it no longer exist, it is left to flounder as ungainly as a squid out of water.